WELSHPOOL, Australia - April 16, 2019 - PRLog -- TLS Productions is an Australian company which provides lighting, sound and audio-visual equipment for events, both small and big. Events range from office parties to large scale concerts and festivals. For instance, it offers draping for hire. TLS Productions is a privately owned sound, lighting and audio-visual company, which caters to events of all kinds like exhibitions, installations, conferences, product launches, weddings, festivals, concerts and corporate events. The company is based in Western Australia. The company was named formerly as True Light and Sound and began operations in 2001. In the last 18 years, it has pioneered its way through high-level industry experience in the constantly changing events industry around the nation. While maintaining professional industry skills for all its technicians, TLS continues to build and utilize its comprehensive inventory of the latest lighting and audio-visual equipment, to ensure the complete success of the event planned. TLS believes in the credo of 'convergence'; that your event is not just a schedule of cues and equipment. Instead, it is a 'here and now' experience determined by the painstaking orchestration of all show elements to enhance the sensory experience of the audience. The company believes in offering exceptional service to clients through innovative planning, design and management of events. This includes the use of contingency planning and attention to detail to ensure that the show will go on at whatever cost. The staffs of the company have been trained very well. They undergo ongoing accreditation training and professional development across emerging production techniques and technologies. They are progressive to seek ways to innovate and maintain state-of-the-art techniques for the success of your special event. One valuable service rendered by the company is the hiring of drapes. One can approach the company to hire draping. The company sells and supplies a huge range of black drapes, backdrops and Cyclorama to offer a professional look for your special event. Apart from framing the perimeter of your venue and maintaining an atmosphere of your event, black drapes can conceal a multitude of unsightly items, which can detract the quality of your event. The company can install 6-meter tall drapes on a stand-alone 'auto pole system', or they can be installed on a truss system and flown into position. 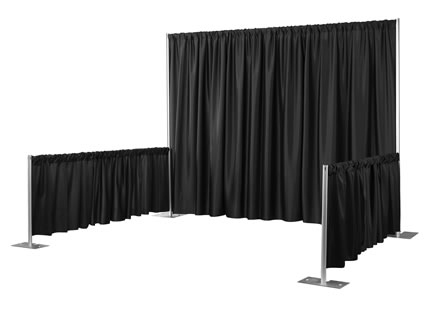 The drapes offered by the company are useful to separate zones like backstage green rooms and stage wings and backdrops. What is the Requirement of Proper Stage Lighting at an Event? What All You Need for the Success of an Event?